While some no longer classify alliums in the Liliaceae family, we still consider garlic part of our garden lilies. They’re flowering now, sending out long slender stalks, or scapes, that remind us of swans, with their elegantly shaped heads dipping and swaying through the tangle of slowly dying leaves. Once the scapes have looped around a full arcing turn, they’re harvested to encourage the plants to concentrate their energy into forming bulbs. It’s an edible portion of the plant that helps to bridge between last season’s harvest and this year’s, and can be used raw or cooked. We’ll be assembling batches of garlic scape pesto, enough for a freezer stash, the rest will be kept fresh in the fridge for as long into the summer as they’ll last. Planting: After the new moon — Shishito peppers, companion basil and French marigolds. Harvesting: Music garlic scapes, shell peas, salad greens, arugula, kale. Preserving: Quick Sugar Snap Pickles, freezing peas. This entry was posted in garden and tagged garlic, scapes. Bookmark the permalink. I love your harvest basket. Maine Garden Hod, based on traditional clamming ones! I love scapes – just picked the last of them yesterday. It’s scape time here too! I tried pickling them for the first time. I can hardly wait two more weeks to see how they taste. Happy July! 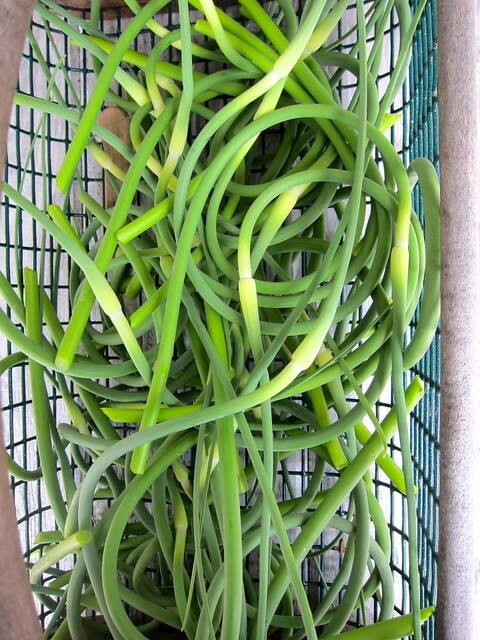 Nice batch of scapes. I was away for a week during scape season but my son filled in for me so I have a large bag in the refrigerator. I’m planning to try your pesto recipe and Daphne’s salad dressing. And you also reminded me to try pickling some, as well as the snap peas I have coming in now.